Please check our website for complete description and examples. Feel free to send me features requests and optimizations ideas! I wonder how such tool fits in the workflow of a demo coder. Wouldn't it be nice have such tool in JS ? It would to work online and offline, be smaller, not require .NET or Mono. I doubt there would be any noticeable speed difference. Idealy this could be combined with something à la ShaderToy to see the result right away and be able to tweak the original shader, minify it, compare sizes and results. p01: usually, people don't write their intro in their browser, they use a compiler + IDE. They can call this tool just before compiling in release and calling crinkler. The tool outputs either some C code or the shader alone (if someone wants another output format, I can add it). I'm not sure if it would be useful to put this tool online, but I can try to use it as a CGI. The code is quite complex - I doubt anyone will rewrite it in JS. really cool LLB, I did once a ShaderStrip equivalent handling vertex and fragment shader uniform problem... but I was not enough motivated to integrate a full parser! ;) Nice job! @p01, well shader obfuscation is mainly used when you are coding a 4k in c/c++/asm, checking compression ratio against crinkler, so I don't really see benefit of a cooperative usage with shadertoy... and It's indeed nice to have such a tool integrated in an intro build process. Gargaj: yes. Some features such as the #define are not enable by default because it makes the compressed result bigger (even if the uncompressed file is much smaller). The name of variables and functions is based on a statistical analysis of the code. Names are reused as much as possible, using function overloading and variables shadowing, in order to make the output compress better. I have some ideas for the next version (using type information + detecting patterns in the code), but if you have suggestions to improve it, I'd love to hear them! Can someone bother to recompress some intro using it to see what happens? with em defines for globals its absolutely working. rulez added on the 2010-06-16 03:33:49 by ɧ4ɾɗվ. r0x0r, very very nice ! i've been waiting for that. cool! xTr1m: I didn't expect people would use it (you can always reorder, right?). Anyway, I'll update the parser, and I will also add recent GLSL features (invariant, centroid, switch...). My idea of having such tool written in JS and integrated with shader preview was to be able to spot the eventual errors and glitches introduced by the minifier and to reduce the turn around time ( no need to re-compile ). To allow for more tweaking. But yeah shaders optimization belong in the intro build process, regardless of the language. God is French it turns out. Nice stuff! Have anyone tried how much space it gives after compression? One question: why does it always leave leading zeros before negatives? I mean transformation "-.3 -> -0.3". yep, remove that zeroes ! also i might add that no software ever was able to replace any human being ! 4ks are humans prods made by humans and stripped down to few of bytes by humans ! added on the 2010-06-17 08:02:27 by ɧ4ɾɗվ. making 4ks is fun for coders, so dont spoil any fun by using any software, just do it by hand ! if you do 4ks you are seriously doing major-demoscenish stuff so dont cut yourself by taking the easy road ! added on the 2010-06-17 08:07:51 by ɧ4ɾɗվ. Seriously, this tool doesn't prevent you from working to the last byte on a 4k. But it will do some nasty job for you, like the statistical analysis for naming. And no doubt you will still have plenty of low level work to do. exactly what i said ! i wouldnt want to have some rewritten code and need to find out first what got renamed to what instead of renaming it all by myself and still having the control of what is what ! ofcoz if you think its worth it, use that tool and youll be fine ! i wont ! added on the 2010-06-17 10:50:17 by ɧ4ɾɗվ. Yep, I've read your discussion in the forum just now. Sounds like a perl job. Implementation on .NET -- why-oh-why??? Perl would have been perfect if it was a regexp oriented work. However, this is far more complex; you can think of it as a compiler: it parses the source code, generates a tree (AST), makes transformations, simplifications... and outputs the result. This allows complex code optimizations that you couldn't do with a flat text representation. Nah mate, this is a perl-job. Macros are just ignored for the moment. I can improve a few things, but it is very hard to fully handle macros. For the "for" loop, I need to check if it's valid or not. The variable is reused because it's not used in the block - this is valid in C, but I didn't check for GLSL. Thanks again! @merry: little after GLSL Minifier, someone started TinyHLSL. Though, seeing the code, so far the tool is way more basic. Thumbs for this. Keep working on it, please! I was busy working on my 64k intro (B - Incubation), but it's now released. Be sure this will be improved soon. Thanks for the feedback! Most reported bugs are fixed. If you have any problem, feel free to contact me, it will help me prioritize my todo-list! Updated again today: fewer bugs, better compression ratio (details on Ctrl-Alt-Test website). I'm using this tool for my 8k intro. And I have some suggestions. My program is using 'glBindAttribLocation' and 'glTransformFeedbackVaryings'. These functions take input and output vertex attribute's names in vertex shader. So 'in' and 'out' variables in vertex shader needs to be '#define' like uniform variables by GLSL minifier. And my program using multiple shaders and they share same name uniform variables. So I want GLSL minifier write #define names which have shader file name. const char *foo_vertex_shader_vs = ""
Thanks for the feedback tomohiro, I'll add these features in next update (drop me an email if you need it sooner). I'd like to have a command line argument so that it won't rename in and out variables, I'm generating direct shader output, no C header, and need the variables as designed. tomohiro & xTr1m: I have updated the tool. "in" and "out" variables are handled the same way as "varying" and others. Use --preserve-externals flag if you don't want them to be renamed. New download url. Many updates, including support for HLSL. Second thumb up to make it working with HLSL! Welcome to ShaderMinifier! This is a great tool! I'm using this tool when I make prod for revision. But I found some bugs. It show Parse error if "#if 0 ~ #endif" is used inside function definition. And it also show Parse error with unsigned int constant. If I change unsigned int constant for signed, GLSL compiler generate errors or warnings. I can avoid this error by replacing all uint with int. But I would like to use uint type rather than int in my shader. Doesn't seem to like "gl_FragData", is this an error? Just something you should be aware of..
Shader Minifier doesn't allow this style? and I long for "not rename function" option. Thanks for the feedback, I'll try to fix all this in the next release. 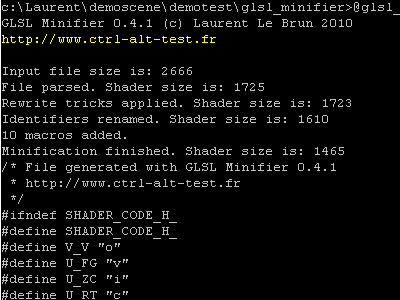 For lazy people and .NET haters, there is now Shader Minifier Online. Sevaral functions are renamed to same name with HLSL that has a lot of functions. That's called function overloading and it's a feature. But if you've got conflicts in your entry points, that's something I will fix. It also seems support for attributes (like "maxvertexcount(12)]" and "[unroll]") as well as Geometry Shader input types aren't supported either. That should have been "[maxvertexcount(12)]", of course. LLB: any news on the fix (2011-06-21 00:06:22)? The minifier generates several functions with the same name, one of those should be the entry point of my shader... It'd be cool if you could at least provide an option to prevent any function to be given a name that appears in the "no-renaming-list". That way I can tell the minifier in the "no-renaming-list" which functions are my entry points. Thanks, this one is fixed. Support for DX10 will come later. very cool stuff! :) thanks for the source release! Fantastic tool. Thank you for this. page created in 0.021144 seconds with 15 queries.